The Hong Kong of India. The Singapore of the Middle East. The Miami of Africa. No wait, make that the Hong Kong of Iran. Or is it the Vegas of this part of the world? For a first-timer, a week in the United Arab Emirates—essentially a twin-headed city-state of Abu Dhabi and Dubai, though there are five other emirates—is a dizzying experience as you struggle to wrap your mind around the multiple vital roles this small country on the Arabian peninsula plays as a regional, and increasingly global, hub. “As a small country, we must be many things to many people,” says Mishaal Al Gergawi, the managing director of the Delma Institute, a think tank based in Dubai. To visit the UAE is humbling on a number of fronts. The combination of outsized ambition and seemingly unlimited resources for cutting-edge infrastructure is awe-inspiring. At a more basic level, the UAE eviscerated my stereotypes of profligate “resource-cursed” petro states in that part of the world. This is a country that is clearly planning for the future. In Abu Dhabi, we visited the sleek headquarters of one of the world’s oldest and largest sovereign wealth funds (with assets in the $800 billion ballpark) that was established in the 1970s to invest the emirate’s oil bounty around the world. More striking than the fund’s sleek skyscraper, or the mind-boggling amounts being managed from it, were the pictures on the conference room’s walls of the small dusty fishing town that Abu Dhabi amounted to in the 1950s. One of the fund’s senior executives grew emotional when I asked him about the photos, saying those pictures remind him of where he grew up, and motivate him to work to secure a better future for his Emirati countrymen (of whom there are fewer than 2 million, living alongside some 7 million foreign workers), even after the oil is long gone. You hear that a lot in the UAE, the need to plan for a post-fossil fuels future. Even the notorious glitz of neighboring Dubai—a 90-minute drive from Abu Dhabi—is less a monument to the urban bling vast wealth can acquire (though there is an element of that) than it is a Plan B. Back in the 1980s, the emirate deliberately set out to build a 21st-century trading post, a sparkling city that transcends nationality. Singapore, and to some extent Hong Kong, provided the recipe. 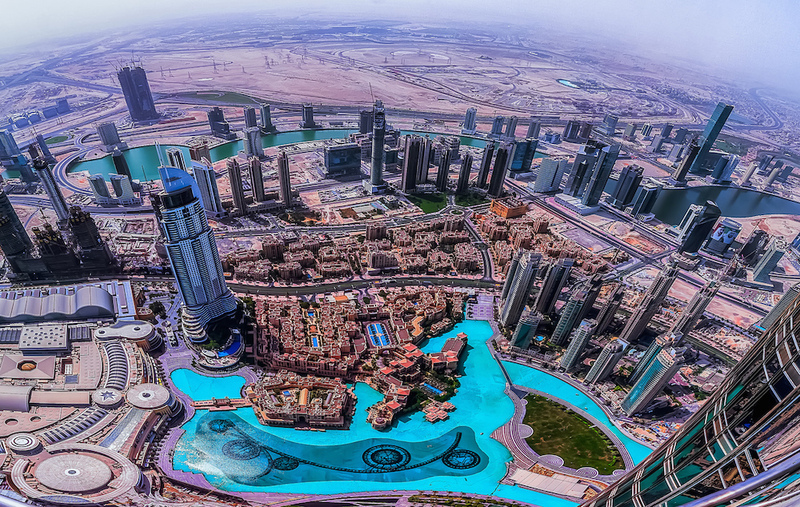 Dubai bet on four key “pillars”: trade, aviation, tourism, and finance. Back in the day when Singapore put itself on the map by building the world’s best airline and marketing it via its ubiquitous “Singapore Girl” ad campaigns, the Emiratis leased two old planes from Pakistan’s state airline to launch what has become, improbably, the leading global carrier in terms of international traffic. Emirates and Abu Dhabi’s rival world-class carrier, Etihad, don’t boast of local women serving its cabins, but pride themselves on hiring pilots and stewards from around the world; like their home base, these are global carriers seeking to transcend nationality. And they mainly have branded themselves—and their nation—by splurging on European soccer club sponsorships. I myself am guilty of being a walking “Fly Emirates” billboard, as a diehard Arsenal fan with a collection of the club’s airline-sponsored jerseys. The less flashy, but equally important, building blocks for a global trading hub are an unconditional commitment to the rule of law and logistical prowess. Dubai imported English common law and financial regulations to entice investors and expanded its port facility and adjacent free-trading zone, becoming over time the banking and trading center for the entire region. Dubai Ports World has become as influential a player in its industry as Emirates is in the airline business, managing ports around the world (you may recall the political controversy a decade ago over an attempt by the company to add some U.S. ports to its global portfolio of managed facilities). Dubai has thus become the missing link in the global supply chain—the node connecting East Asia’s dominant financial hubs and London. I can thank (or blame) Afshin, a fellow at the Foreign Policy Institute of Johns Hopkins University’s School of Advanced International Studies who has long studied the region, for my dazed confusion while in the UAE. He’s the one who kept volleying Singapore/Hong Kong/Miami analogies my way during the week-long SAIS-sponsored trip I took, along with a dozen or so other academics and Washington policy analysts looking at the economic role of the UAE and UAE-U.S. ties. As a new city boasting ostentatious skyscrapers (the world’s tallest! ), malls (the biggest! ), and five-star hotels (the costliest! ), it’s easy to knock Dubai as lacking in “authenticity” (a similar knock made against Singapore by Westerners who don’t always appreciate when modernity encroaches on their romanticized view of what more tropical locales should be like). But as Afshin pointed out during our visit, the critique is a bit unfair: It isn’t as if there was much here beforehand that is now being swept away. And there is no way to overstate the importance of a hyper-functional nation in the heart of the Arab world, one in which people of all faiths and backgrounds are welcome to come and pursue their dreams. That’s the thing about embracing free trade, and wanting to be a connector. It breeds tolerance. No one pretends that the UAE is a freewheeling democracy (not by a long shot), but you don’t become a global hub that attracts people from all over the world to live and invest in if you don’t tolerate their creeds and customs and foster a laissez-faire approach to life and the world around you. You don’t become the destination of choice for Iranians, Saudis, East Africans, Indians, Russians, and Chinese traders, financiers, and vacationers if you are prejudiced against any of them. In that sense, the best precedent for what the UAE is accomplishing in the 21st century may not even be Singapore or Hong Kong, but the Dutch Republic of the 17th century, which embraced pragmatic capitalism (and the tolerance of others that comes with it) over any other dogmas to become the global trading hub of its time. At the same time, this is a bit depressing because, as with Hong Kong and Singapore, it’s happening in a small technocrat-controlled environment, an offshore haven to a larger region, unburdened by the heft of a large nation’s sticky politics. The UAE is succeeding because large countries like India, Egypt, and Iran failed to become that missing node in the global supply chain between East Asia and London. Think about it. Air India, as a matter of geography, had every opportunity to play the global role that Emirates is now playing. And why didn’t Mumbai become the financial hub that Dubai has become? Or why didn’t Egypt, with the Suez Canal, become the logistical crossroads between Asia and Europe? And so the UAE leaves you with this slightly unnerving question: Is this place destined to remain a remarkable safe haven removed from the madness and dysfunction that surrounds it, or it is it a replicable model, a blueprint for the Arab world’s future? *Photo courtesy of Maher Najm.